I LOVE a good home-grown success story and local scarf brand Bird and Knoll is a great tale. It’s the tale of a chance meeting of two women, of the discovery of a shared passion and vision and a tale of wanderlust. Bird and Knoll is also a tale of two cities, and a journey that has taken them to the corporate halls of high-flyer Qantas, Australia’s national air carrier. “Bird” is Macayla Chapman, the marketing wiz who resides in Auckland, and “Knoll” is Natalie Knoll, the photographer and founder, who lives cross the ditch in Randwick, 8km south of the Sydney. Knoll arrives for our interview dressed for the weekend — smart casual and draped in one of Bird and Knoll signature travel-themed cashmere-blend scarves. “This one is Edinburgh,” Knoll explains as she unfurls it from around her neck and shows me the image of a cobbled street in the Scottish city. Born and raised in South Africa, Knoll is a former derivatives analyst who worked in London and New York with her husband before settling in to Sydney with their two children a few years ago. Despite a career in the cut-and-thrust world of banking, Knoll, didn’t really see herself as a corporate person climbing the corporate ladder. But she always had a passion for photography, and consequently moved into that 15 years ago. So it was during a family holiday in Hawaii that Natalie had the idea of digitally printing her travel images onto a scarf. And thus the birth of Bird and Knoll, the highly covetable and very collectable, cashmere-blend scarves. So how does it work running a business from two countries across two time zones, particularly as you both have young families to juggle? From their humble beginning in 2014 to partnering with Australia’s national air carrier Qantas, Bird and Knoll has grown very quickly in such a short period of time. 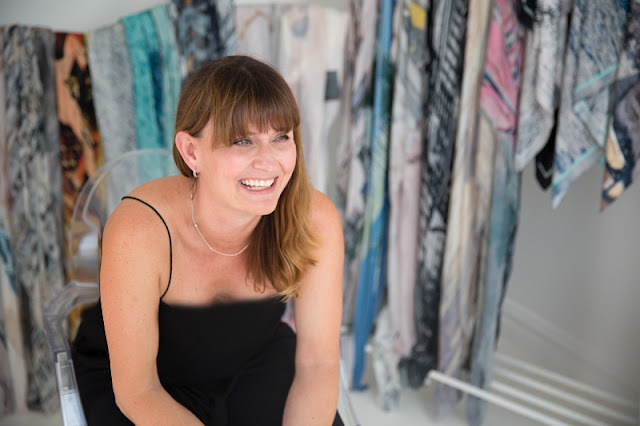 The Bird and Knoll scarves have become synonymous with great style and well-travelled fashionistas who covet gorgeous pieces. 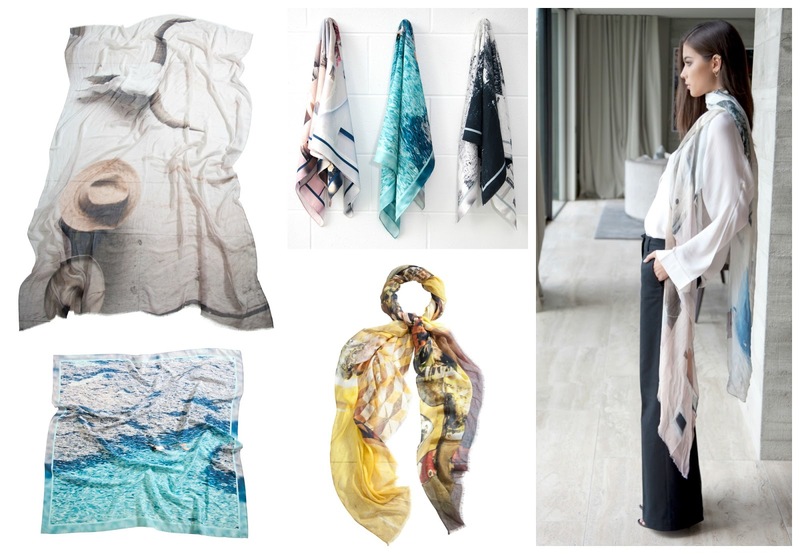 Bird and Knoll scarves (from top left): Mexico (Miraflores), three of the new silk squares, a campaign image of Sakura’s travels, the colours of a Morocco barber shop, and the coral gazers on the silk Oahu. 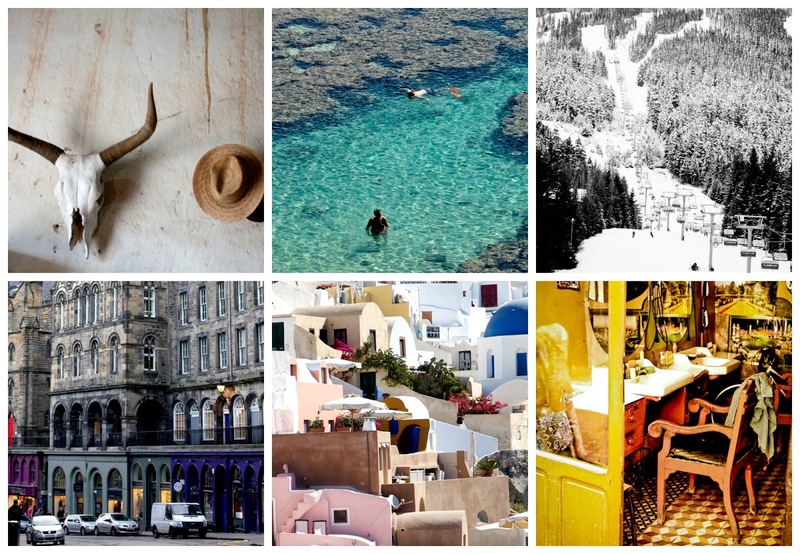 Each image encapsulates the spirit of each destination and provides a sense of escapism whether you’ve visited the place or not. A walking postcard, if you will. There’s an eclectic barber shop in Morocco, leather and skulls on the west coast of Mexico or the cobblestones of Edinburgh. Or escape to the powdery slopes aboard Whistler Blackcomb’s Wizard Express, the white-washed buildings of Santorini or the impossibly blue waters and coral paradise of Oahu beckons. And the Qantas “Feels Like Home” scarf features Melbourne’s funky Hosier Lane with its graffiti art and popular cornerstone restaurant MoVida. The scarves are also the ultimate travel accessory — they are lightweight, versatile and will fit easily into handbags and beach totes for outfit edits on the run. And this season sees the release of a new silks collection. Next, Natalie confides, is a collection of easy leisure/lifestyle-inspired “items you can throw into an overnight bag for a trip to Bali, easy pieces that travel well and don’t let you down”. “We now have more confidence to move into apparel,” Knoll says. “Scarves might be our core, but we can do so much more. “Collaborations are the future — people want to know that their favourite brands are talking to one another. So we’re partnering with a boutique hotel group and a well-known jewellery brand to do a few things. Watch and learn how to tie the Bird and Knoll scarves six chic and different ways. In the mellifluous tones of Monty Python … “Always look on the bright side of life”. You are most proud of …? My children. My two girls are nine and 11 now and growing into amazing young compassionate people with smart minds and interesting thoughts – they're starting to really question things with intelligence and put forward their own views on things. People are surprised that …? I used to be an investment banker in London and New York. There is a world of difference between fashion and banking but I think both experiences have been invaluable. him about needing to get new material sometimes! When I am with family and friends. Where I see wrinkles, they see laugh lines. What are the skincare products that you can’t live without? Clarins Beauty Flash Balm and Mecca Cosmetica In a Good Light tinted moisturiser. moisturise and drink lots of water. I am still struggling with the drinking of lots of water … I just forget to. But I think that my beautician is a bit of a beauty secret. She is amazing! when we are working on our collections. What is your signature scent (fragrance)? Jo Malone Peony and Blush Suede. People often comment on it. I adore Jo Malone fragrances – very fresh and understated. How has your personal style changed through the years? I am definitely more confident with a greater sense of what does or doesn’t work for me. I have found that balance of wearing classic pieces but introducing an interesting edge either with accessories or in the way that I wear something. I didn’t have that confidence or knowledge when I was younger. Chocolate! I have a Lindt Ball with my tea every morning. I am also a little bit obsessed with Netflix at the moment – so many great shows on there! Your style icon or muse? bring together colours and textures. What is your go-to outfit/your signature style? Skinny jeans, boots (I just bought a pair of Acne Jensen boots I have been eyeing off for a while), a well-cut shirt from Equipment or Bassike and a blazer. Nothing trailblazing but anything that’s easy to edit for day into night and comfortable to be in. You would never wear …? Crop tops, flares, thigh-high boots. They don’t suit me and I just wouldn’t feel comfortable in them. You have to own (the look) what you wear! Anything in your wardrobe you’ve never worn? 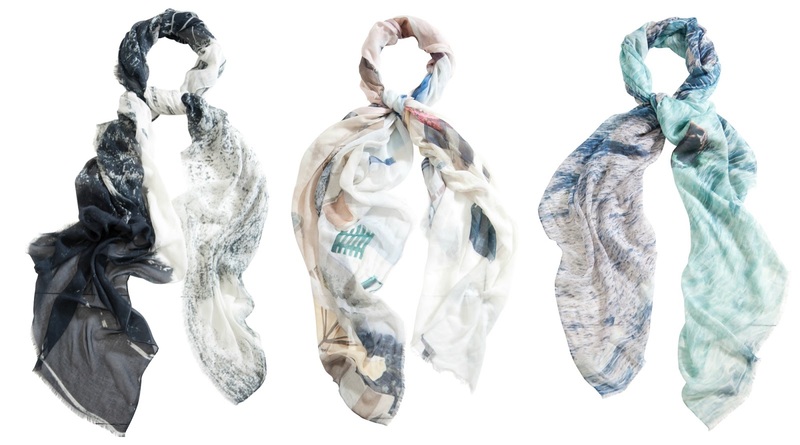 The Bird and Knoll cashmere-blend large wrap scarves (from left) Whistler, Santorini and Oahu. My Louis Vuitton tote. I loved going into the flagship store in London to buy it. It is the most durable, versatile and elegant accessory. Absolutely timeless. I love dressing it up with one of our silk Bird and Knoll scarves tied to the handles. The biggest mistake women make when it comes to fashion? Wearing too many trends at once. You just look like a fashion victim then. Your favourite fashion designers or influencers? We have so many incredible established and up-and-coming Australian designers. Dion Lee, Christopher Esber and Toni Maticevski are all so talented and pioneering. I am always amazed by my trusted go-to designers – Bassike and Zimmerman. Garance Dore talks about finding the right balance between dressing for the life you want and dressing for the life you have. In other words, be creative with what you have. I dress for comfort most days when I am working in the studio but can easily smarten up with a pair of heels and a blazer. Shoes. I don’t buy many pairs during the year but I do invest. A Bird and Knoll scarf (I always carry one with me), my diary, my iPhone, a couple of my favourite Hourglass lipsticks, hand cream, Rescue Remedy pastilles, sunglasses and my wallet. My family, my home and a purpose. Flats … If I didn’t have a bad back I would probably wear more heels. What does every woman need? Someone to make her a good cup of tea at the end of the day, a good beautician and a Bird and Knoll scarf. or Husk. The Qantas “Feels like Home Scarf”, is available at qantasshop.com.au and David Jones. Someone you admire and would to read about, drop me a line and let know.